f you’ve read the “Harry Potter” books or seen the movies, you know Quidditch is a sport played by wizards and witches that involves flying around on broomsticks. In 2005, students at Middlebury College in Vermont invented the real-life or “Muggle” version, which resembles a combination of basketball and rugby with elements of hockey and dodgeball mixed in. The sport is gaining serious momentum; hundreds of colleges and dozens of high schools have teams. There’s even a 16-team pro league, Major League Quidditch (Chicago does not have a team as of yet), as well as international competitions. To make sense of the organized chaos you will see if you ever watch a match, RedEye picked the brains of Matt Coyle and Chloe Streif, co-captains of the Columbia College Quidditch team. Quidditch is played on a grass field with a soft boundary area that is 60 yards long and 36 yards wide; this is where most of the action takes place, though the hard boundary area is 84 yards long by 48 yards wide. There are three hoops of varying heights on each end of the field. The corners are similar to those of a hockey rink in that they are curved. There are areas designated as keeper zones and penalty boxes. Five balls are in play during Quidditch matches: The Quaffle, which is a volleyball; three Bludgers, or dodgeballs; and the Snitch, a tennis ball. The Quaffle is used to score points, while the Bludgers are used to “knock out” other players temporarily. The Snitch is the ball that must be caught to end the game. Each player must have a broom between his or her legs at all times. Padding that makes a “knocking sound” when a referee hits it with an object is not allowed. So no football helmets, shoulder pads or anything of the sort. Cups are allowed, as are padded helmets. The brooms cannot be used to contact other players. Each match has one Snitch, a person dressed in yellow who wears a sock with a tennis ball attached to the back of their waistband. To “catch the Snitch,” a Seeker has to grab the ball as they would another player’s flag in flag football. The Snitch is a volunteer, and often a player from one of the teams in the match. That person is expected to be impartial in preventing Seekers from grabbing the ball. In tournament play, the Snitch is usually a person who is not on either team competing at the time. There are also certified snitches available through the U.S. Quidditch association, which often is the preferred situation if teams can accommodate one for matches. Quidditch, including governing bodies such as U.S. Quidditch, prides itself on being inclusive. To that end, it employs what is known as the gender maximum rule. According the U.S. Quidditch website, no more than four players per team who identify as the same gender can be on the pitch at a time; that number increases to five when Seekers are in play. The team that scores the most points wins. Teams score points in two ways: when the Chasers throw the Quaffle through one of the hoops from either side of the hoop (10 points), and when a team’s Seeker catches the Snitch (30 points). The Snitch enters the game at the 18-minute mark of each match. The match ends when the Snitch is caught. The match starts with the Quaffle and Bludgers at midfield, and on the referee’s signal, each team races to get possession. Once a goal is scored, the Keeper of the team that was just scored on takes possession, and play resumes from there. Beaters throw Bludgers at opposing players to get “knockouts” or “beats.” When that happens, a player who has been “beat” must run to their end of the field, touch one of their hoops and “remount” their broom. Any player who is holding a ball when they are “beat” must immediately drop the ball. 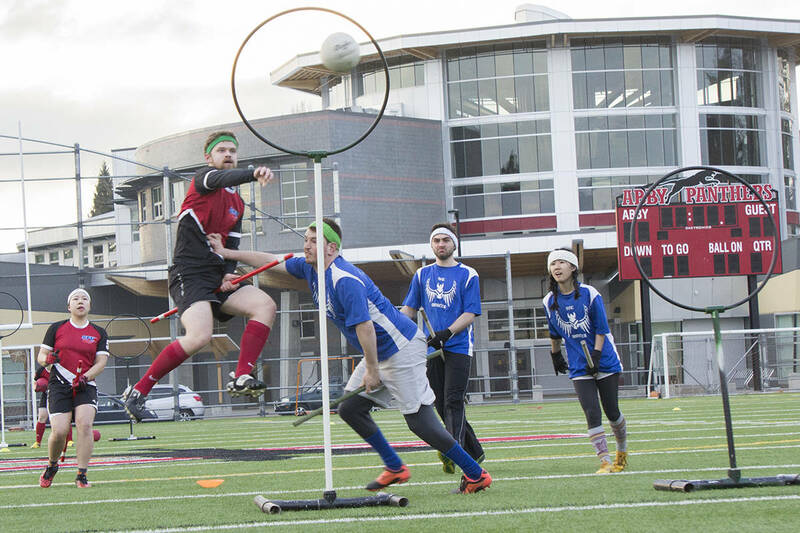 Whether it’s at a college tournament, such as the one Columbia College held Nov. 12, or any other organized event, there are common threads in Quidditch matches. The game is hella physical. Players are allowed to tackle each other, stiff arm and do almost anything to dislodge a Quaffle or Bludger from an opponent or to keep the other team from scoring. You do not have to give up possession of a ball unless you are “beat,” however. As far as contact, players are not allowed to tackle an opponent who cannot see them. You also cannot lift an opposing player off the ground or tackle a player who is in midair. Players who commit fouls are sent to a penalty box, sometimes (resulting in power plays). If the infraction is severe enough, players can be ejected. You won’t see robes. At least, the players don’t wear them. Even though the sport is based on a fictional wizarding pastime, shorts and jerseys are required. As for the spectators, anything goes with clothing. The scores can get up there. Coyle said he has seen college teams can score in the 150- to 200-point range, while Major League Quidditch matches can see one team score around 300 points. “Harry Potter” knowledge is not required. “We have players who have never seen or read ‘Harry Potter,’ some of whom are captains,” Coyle said. Next articleOscar nominations are here: Did your favorite films make the cut?